At Decks & Spas, we only offer quality products that we believe in from premium manufacturers across the United States. On top of that, all contracted projects are original works, designed and built by us. While we are very confident in all the products and services we offer to our customers, we understand that after sales support is just as important. 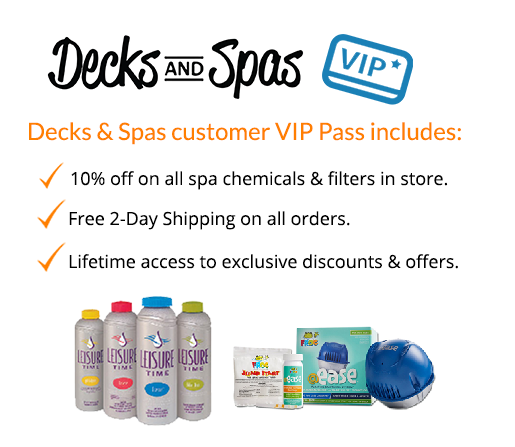 We know it can be tempting to buy everything including chemical and spa supplies directly from your online retailer but give Decks & Spas a chance and we promise to make it worth your while. If you bought your hot tub from Decks & Spas at any time in the last 20 years you automatically get a 10% discount on all spa chemicals we sell. On top of our already competitive pricing a 10% discount could make a difference on your annual spa maintenance costs. We also offer free 1-day and 2-day shipping to all of our customers in Western Washington. If you bought a spa from Decks & Spas you could be saving time and money by buying your chemicals and supplies from us too. Give us a call to place an order or for additional information. We will also have a chemical subscription service available exclusively to Decks & Spas customers offered in the coming months. At Decks & Spas we are proud to serve our customers with our very own in-house service and parts department. We understand that hot tub service & repairs can be daunting to spa owners are are determined to help, we strive to give all our customers a fair deal and leave a lasting impression. All spas that we sell are covered under a comprehensive warranty and we pride ourselves on quick turn around times and thorough repair and check up of your spa. Decks & Spas specializes in servicing many brands including MAAX EliteSpas, LA Spas, Coleman, Tropic Seas Spas and CalSpas. Due to our parts inventory, part availability and the spa technicians specialized training we may not be able to service hot tubs not purchased at Decks & Spas. Please feel free to give us a call for more information, if you have a different brand of spa, we’ll do our best to get you the help you need. *One-Time, Quarterly and Monthly cleaning services are available exclusively to customers who have had their spas previously serviced by Decks & Spas in the past 12 months or had purchased their spa from Decks & Spas. For new customers we offer Spa Renewal cleanings and spa check up services, please give us a call for more information on available services and pricing. New customers or customers that have lapsed on their spa cleanings are required to have a Spa Renewal cleaning performed on their spa before starting scheduled cleanings. The spa renewal cleaning service is priced at $220. Decks & Spas takes great pride in the products & services offered to customers. Spa covers are no different. Our hot tub covers are manufactured locally in Washington using marine grade vinyl and sewn with quality polyester thread. Under the vinyl is a tapered high density foam core made from lightweight and durable polystyrene foam. The foam is lined with metal channels for maximum durability then sealed with 4mil plastic to prevent water saturation. To order, download and fill out the Cover Order Form (located above) then submit the form by uploading to our online Cover Request form (located below). Spa Moving services are offered at Decks & Spas, pricing is below. Unfortunately, we are not able to move or install brand new spas delivered curb side from online retailers. Our rate is $180 per hour with a 2 hour minimum. From and To locations must be within a 20 mile radius to Decks & Spas in Kirkland. If you are beyond the 20 mile radius but still want our moving service we charge $1.00 per mile for anything over 20 miles. The hot tub must be disconnected by the home owner or a licensed electrician. You can call us prior to arrival for advice and we can help walk you through the process but we can not do it ourselves. The spa should be drained prior to arrival. We can drain the spa but it will add additional expense due to added time. If the spa move requires a 3rd man it will be an additional $50.00 per hour.